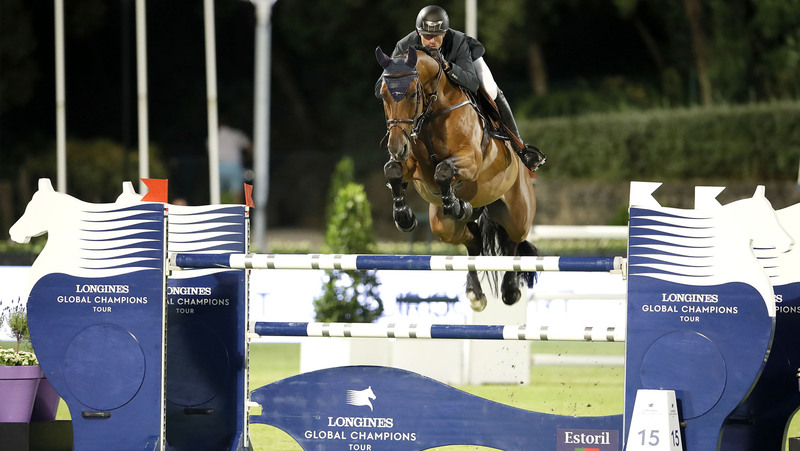 The in-form Gregory Wathelet (BEL) and Qualido took a second win of the weekend at the Longines Global Champions Tour of Cascais, Estoril, battling against the elements to triumph in the CSI5* evening class. Under the bright floodlights, Wathelet delivered the only double clear in the picturesque grass arena, finishing ahead of Julien Epaillard (FRA) with Safari D Auge and Simon Delestre (FRA) with Filou Carlo Zimequest in front of thrilled VIPs and spectators. The gusty winds and dancing shadows threw an outside element into the mix, with many horses jumping well but unable to keep a clear score, distracted by the wind. Abdel Saïd (EGY) and Venise du Reverdy were the first to leave all the poles up, but agonisingly picked up a single time fault. Similarly Christian Ahlmann (GER) gave Take A Chance On Me Z a phenomenal round, keeping the horse’s attention and reassurance all the way through the course to jump clean, but also collected 1 time penalty. There were plenty of retirements and scores to forget today, with the likes of Romain Duguet (SUI), Lorenzo de Luca (ITA), Gerco Schroder (NED) and Luiz Felipe Cortizo Gonçalves De Azevedo Filho (BRA) all electing to save themselves for another day. It took more than half the field to go before Cascais saw its first completely clear score this evening, after Denis Lynch (IRL) with Fairview Aliquidam powered around the arena, putting pedal to the metal to finish cleanly inside the time. However he was quickly followed by Gregory Wathelet (BEL) with Qualido, meaning there would be a jump-off, with Julien Epaillard (FRA) and Safari D Auge, Simon Delestre (FRA) with Filou Carlo Zimequest, Pedro Veniss (BRA) with For Felicila joining them. So it would be a six rider jump-off with Denis Lynch (IRL) first to go on Fairview Aliquidam. The duo blazed around the shortened course, but the GC oxer caught them out after Fairview Aliquidam broke into a trot, picking up four faults. The final Longines oxer fell to give him a total of 8 but the pair were fast, setting the time at 45.97s. Gregory Wathelet (BEL) and Qualido looked on flying form, taking the first fence on an angle. The Belgian rider turned on a hairpin back to the final fence, taking the huge striding horse flat out to the oxer to clear it in 41.52s - there was a new time to beat. Four faults at the GC oxer for speed demon Julien Epaillard (FRA) and Safari D Auge ruled them out of contention, despite the pair posting the fastest time so far in 40.77s. A pole for compatriot Simon Delestre (FRA) and the 9 year old Filou Carlo Zimequest would mean they too dropped off the top of the leaderboard, with two left to come. An unusual refusal at the first fence for Pedro Veniss (BRA) with For Felicila put them on the backfoot and out of the running, with only home hero Duarte Seabra (POR) still to come. The Portuguese rider set off at a steady pace, looking for a clear to finish at the worst second. However it wasn’t to be a home top three result, as a pole fell, dropping Seabra down to fourth overall. So it would be a second big win of the weekend for the on-form Gregory Wathelet (BEL) and Qualido, the pair scooping the lion’s share of the prize purse. Saturday will see the final day of competition in the LGCT Cascais, Estoril, with the GCL Cascais final taking place at 18:00 local time, and the LGCT Grand Prix of Cascais, Estoril kicking off at 21:30. For the full results and all the information about LGCT Cascais, Estoril, please click here.